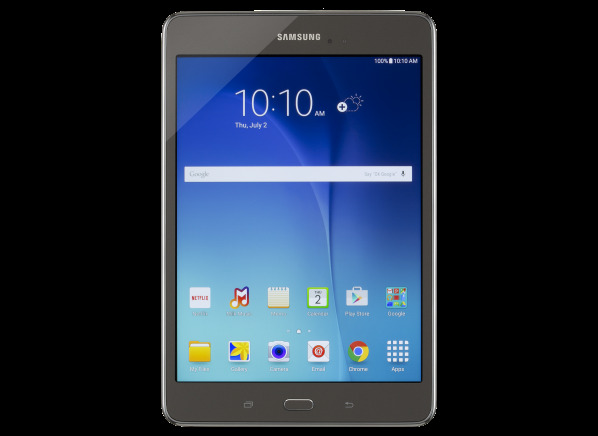 A smaller tablet from Samsung with an 8-inch screen and WiFi internet only, running on the Android 5 operating system. Uses the Google app store for downloading apps. Tested with 16GB of storage. The Samsung Galaxy Tab A 8.0 SM-T350 (16GB) is a smaller tablet computer with an 8-inch screen. It has relatively coarse screen resolution, 160 pixels per inch. The squarish screen is a better shape for photos than for videos, and it utilizes toughened glass for durability. The tablet has a Qualcomm Snapdragon 410 processor with 4 cores. It runs on the Android 5 operating system. It has 1.5GB memory and is available with 16GB storage. You can add a microSD memory card for more storage. There is a headphone jack with a volume control, a built-in microphone, and a mono speaker. Internet connectivity is via WiFi. It has a 2-megapixel webcam, and a 5-megapixel camera. The tablet measures 8.2 inches long by 5.4 inches wide by 0.32 inches thick, and weighs 0.7 pounds.